In the depths of the lake are treasures and mysteries. The movements of this palgwe should be performed knowing that man has limitations, but that we can overcome these limitations. This should lead to a feeling of joy, knowing that we can control our future. Begin on a ready stance (Joombi). Left turn 90° (West), left front stance, left hand high block (Ap Kubi Olgul Makki). Front kick with right foot, land with the right foot in a right front stance position, right middle punch (Ap Chagi Ap Kubi Momtong Jireugi). Front kick with left foot, land on the left foot i a left front stance, left middle punch (Ap Chagi Ap Kubi Momtong Jireugi). 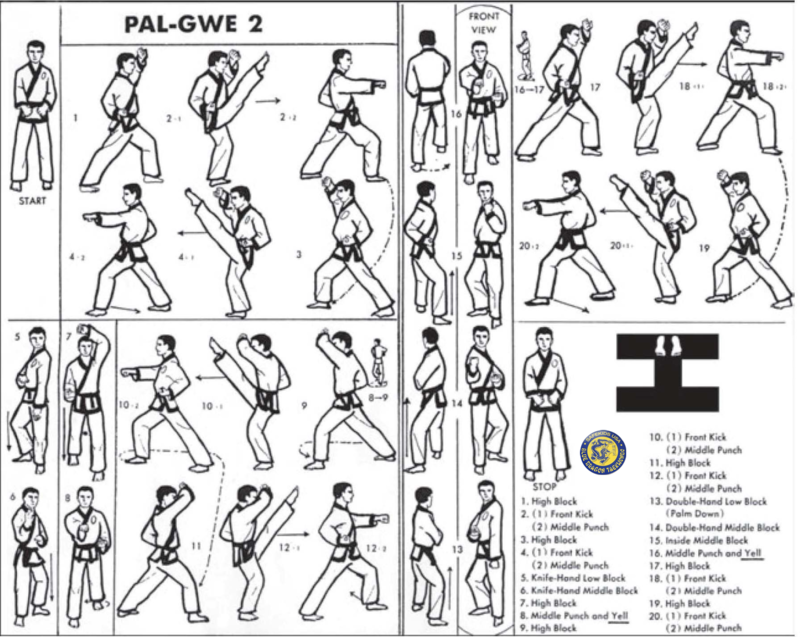 Left turn 90° (North), left back stance, double knife hand low block (Dwit Kubi Sonnal Arae Makki). Step up right front stance, right middle punch. KEUP! (Ap Kubi Momtong Jireugi). Left turn 270° counter clockwise (East), left front stance, left hand high block (Ap Kubi Olgul Makki). Front kick with right foot, land in a right front stance position, right middle punch (Ap Chagi Ap Kubi Momtong Jireugi). Right turn 180° (West), right front stance, right hand high block (Ap Kubi Olgul Makki). Front kick with left foot, land in a left front stance position, left middle punch (Ap Chagi Ap Kubi Momtong Jireugi). Left turn 90° (South), left back stance, double hammer low block (Dwit Kubi Kudureo Arae Makki). Step up right back stance, double hammer middle block (Dwit Kubi Kudureo Momtong Makki). Step up left front stance,left hand outside block (Dwit Kubi Momtong Makki). Step up right front stance, right hand middle punch. KEUP! (Ap Kubi Momtong Jireugi). Left turn 270° counter clockwise (West), left front stance, left hand high block (Ap Kubi Olgul Makki). Front kick with front right foot, land on a right front stance position, right middle punch (Ap Chagi Ap Kubi Momtong Jireugi). Front kick with left foot, landing on a left front stance position, left middle punch. Left turn 90° (North) to starting point, left foot steps back. Assume ready stance (Ap Chagi Momtong Jireugi).